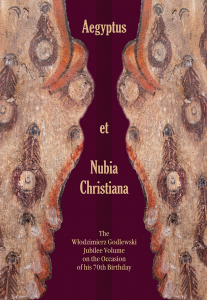 The volume brings together 36 fully peer-reviewed contributions in the field of Christian Egypt and Nubia studies, mirroring a lifetime of academic achievement by Prof. Włodzimierz Godlewski, in whose honor this jubilee book has been produced. The contributing scholars are both colleagues and associates, and the subjects they take up in their studies are focused on issues of archaeology, epigraphy, iconography, ceramics and material culture, as well as history of medieval and post-medieval Egypt and Nubia. In several cases, the articles concern material from two sites, Naqlun in Egypt and Dongola in Nubia, where Godlewski has conducted and directed research. Thus, for Naqlun we have the functionaries of the Nekloni monastery (T. Derda and J. Wegner), literary culture (A. Delattre and N. Vanthieghem, J. van der Vliet) as well as ceramics (T. Górecki) and glass vessels (M. Mossakowska-Gaubert), and architecture of the monastic complex from Naqlun (S. Maślak). For Old Dongola there is a study of Egyptian amphorae with dipinti (K. Danys and A. Łajtar) and costume of monks in wall paintings (K. Innemée). Broader studies concern issues like the functioning of a pilgrimage sanctuary in Egypt in late antiquity (E. Wipszycka), wine consumption and usage in Egypt’s monastic communities in the 6th–8th century (D. Dzierzbicka), aspects of the role of Archangel Raphael in Christian Nubia (M. Łaptaś), observations on the origins of “apse portraits” in Nubian royal iconography (M. Woźniak), the ideology and function of the northern pastophorium of Nubian churches based on inscriptions and paintings (A. Łajtar and D. Zielińska). Church architecture is taken up by P. Grossmann for Egypt and Nubia, and A. Obłuski for Nubia. W.Y. Adams gives an overview of evolution and revolution in Nubian pottery, J.R. Anderson and A. Harrison present unique hair textiles from British Museum excavations in Kulubnarti, while A. Boud’hors and E. Garel discuss what remains of the monastery library in Deir el-Bahari (a monograph of which was published by Godlewski early in his academic career). The history of Baybars’ Nubian conquests is taken up by R. Seignobos. Contributions have been offered also by Nettie Adams, M. Barwik, D. Edwards, K. Grzymski, B. Lichocka, A. Łukaszewicz, G. Ochała, M. Rassart-Debergh, T.S. Richter, G.R. Ruffini, H. and A. Tsakos, J. Then-Obłuska, G. van Loon, D. Welsby, I. Zych and B. Żurawski.